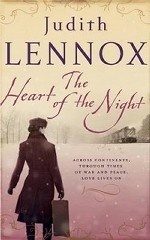 Аннотация к книге "Heart of the Night"
An epic novel of passion, betrayal and danger, set in wartime Britain and Europe. In the spring of 1936 Kay Garland embraces an exciting new life of glamour when she becomes companion to Russian Konstantin Denisov`s daughter, Miranda. The two girls become firm friends, and when Miranda falls in love with a young Parisian, Kay helps her keep the relationship secret. But Konstantin learns of the affair and promptly dismisses Kay, leaving her penniless and stranded in Nazi Berlin. By chance she meets Tom Blacklock, who pays for her ticket home, and is destined to play an important part in her life. As for Miranda, she makes a decision that will put her in the path of disaster. With the outbreak of war come death and destruction and, for both women, consuming passion, along with the fear of losing all that they hold dear. After Hitler`s defeat, there are new dangers - and opportunities to find love where least expected.